Single-ply roofing is an extremely popular option for commercial roofs because of its versatility, durability, and ability to last for decades. Whether you need single-ply roofing installed, repaired, restored, or replaced, E&E Construction is the company for you. As a proud member of the Choice Roofing Contractor Group, we’ve shown to be an industry-leading commercial roofing contractor for clients in and around Springfield, Ohio. Give us a call today at (740) 331-0695 for a free onsite estimate. Single-ply roofing is a lightweight layer that adheres to the surface of your roof through a number of techniques, including heat application. 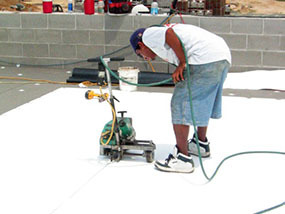 E&E Construction can apply several types of single-ply roofing, such as EPDM, PVC, and TPO. When we come to evaluate your roof, our team of experts will advise you on the best kind of single-ply roofing for your specific building. Single-ply roofing is a low-maintenance and cost-effective roofing system that can last over 50 years. It’s a great choice for commercial roofs because it’s fire resistant, UV resistant, and makes your building more energy-efficient. Plus, it’s backed with a warranty to ensure that you get what you pay for. While single-ply roofing systems can last decades, it may require some maintenance here and there. We always recommend getting regular roof inspections to ensure that everything is in order. This way, E&E Construction can perform minor repairs or restoration solutions that will keep your roof and building in tip-top shape for the long run. A roof coating can be easily applied to your single-ply roofing if your roof begins to give you any problems. Roof coatings are inexpensive and very effective so it’s a good solution to have in your back pocket. 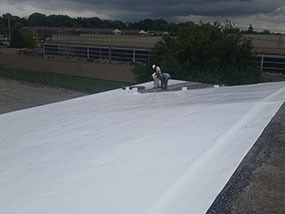 These coatings can be applied during business hours and will make your roof as good as new. Plus, they’ll make your building even more energy-efficient and can save you up to 30% on your annual energy bills. Regardless of the type of commercial roofing service you need, E&E Construction has you covered. Clients in Springfield, Ohio who are interested in single-ply roofing or are in need of single-ply roofing repairs, restoration, or replacement can reach us at (740) 331-0695. We’ll send one of our professionals over to swing by your building and give you a free roof evaluation.